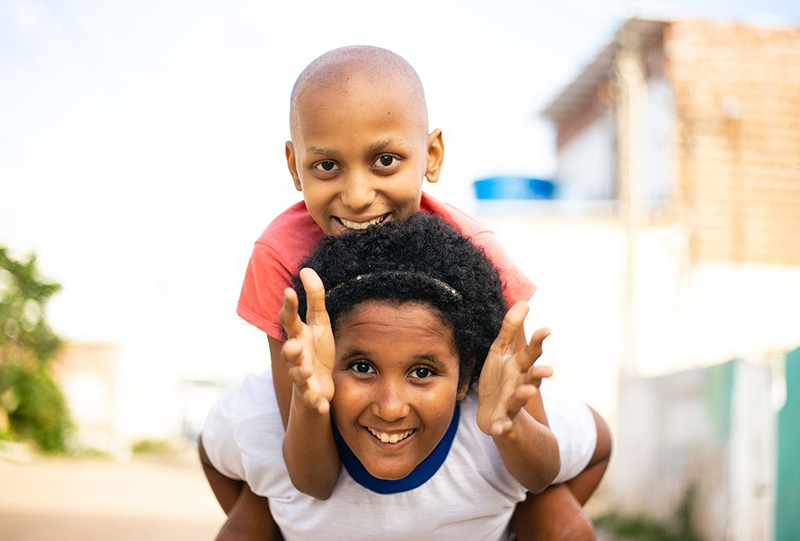 Home >Pray & Connect > Blog Compassion UK Blog >Update: Praise God, Kauany Is Now Cancer Free! Kauany is one of the bravest seven year olds we have the privilege of knowing. Beautiful inside and out, she’s incredibly articulate and wise beyond her years. “I love the colour red. Red is a strong and vibrant colour. It's the colour of love; of the tomatoes that are in my favourite food, pizza; and of the noses of the clowns who visit us at hospital. It’s the colour of the traffic lights that indicate cars should stop. It's the colour of blood coming out of my veins every time I need to do my exams in the hospital. Maybe that's why – while most other girls like pink, red may be my favourite colour because to me it means life. “Life has already provided me with 11 laps around the sun. I was born in Olinda, a city in Brazil famous for having one of the main carnival festivals in the country. But I live away from the cheerful blocks of the carnival, on the second floor of a house in one of the poorest neighbourhoods in the city. Many people are afraid to come here, because it is also home to countless criminals and criminal factions. I’m grateful to God that this didn’t prevent Pastor Rubenildo and his wife, Rosangela, our project director, from planting a church in our neighbourhood. And I’m grateful it didn’t prevent its partnership with Compassion. 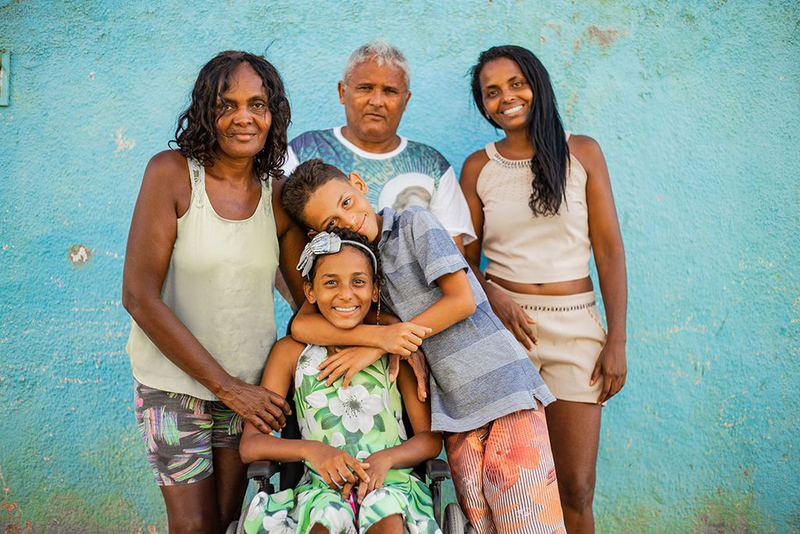 “When I was five, my mother's best friend, Aunt Betânia, told her about the Compassion project. Betânia’s daughter, Tainara, and I have known each other since we were born, and we also became best friends. She has always been my adventure partner. 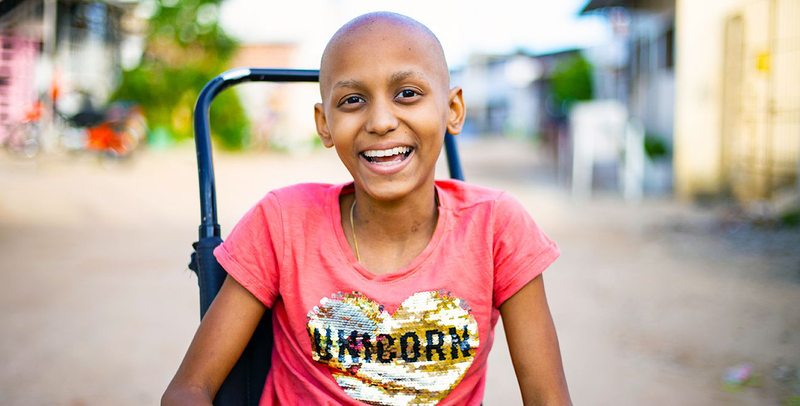 But Kauany’s world was brought to an abrupt stop when doctors discovered a tumour in her spine. “The tumour took many things from me. First, it took my ability to walk. Running freely through the streets of the neighbourhood is no longer a reality for me, only in my best dreams. “In those early days, the only thing my mind could produce was nightmares. One day I woke up and there was a blue and pink wheelchair in my room. The chair wasn’t from someone who had forgotten it. They said it was mine. But I didn’t want that chair. I didn’t want to sit on it. I didn’t want to accept that it would be my means of transportation from then on. I preferred to be carried by my mother or in doctors’ arms than to sit in that chair and admit that I couldn’t walk anymore. 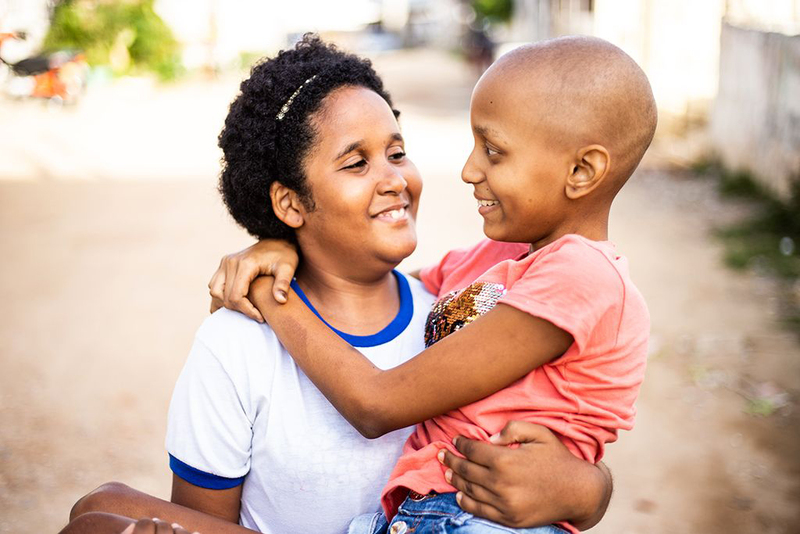 “The tumour also took the joy of my mother and my grandmother. They never cried much in front of me. They held their tears while I cried like a baby. But I knew that when they went out to go to the bathroom or to the next room, they would let the tears flow to comfort their pain. We always lived a tough life, and my situation made things even harder. My mother's arms were already tired. I agreed to sit in the wheelchair. “The tumour also took my hair. While taking chemotherapy medications, I saw every strand on my head go away. My days at home were exchanged for long seasons in hospitals. I stayed away from my friends and the Compassion project, but our director, Rosangela, my teachers, and my best friend, Tainara, always visited me when possible. 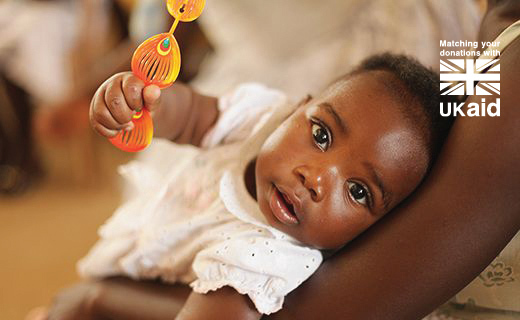 In the hospital, I met many other children like me, and some of them are already living with God. “My treatment lasted about a year, but in my head it took centuries. After that I returned home and to the project. My legs still didn’t let me walk, and I was a little ashamed to meet my old friends again. 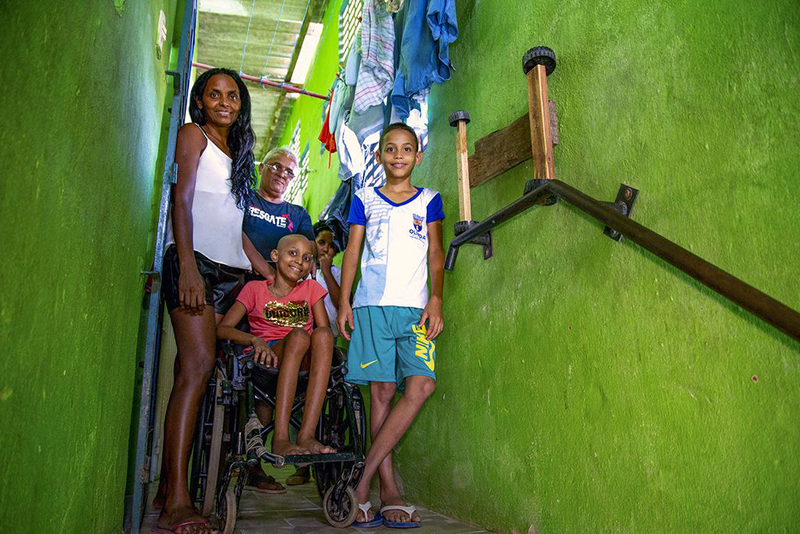 “When I arrived at the project I discovered they had changed my classroom to the first floor, so I didn’t have to go up the stairs. They had also adapted our old bathroom to my new needs. My sense of fear turned into gratitude and joy, for I felt special – not that I was different, but that I was loved. My project friends were happy to see me. No one laughed at me. Despite my limitations, they didn’t exclude me from the games, but they adapted some of them so I could play. Tainara pushed my chair, and we raced with the boys. Sometimes I would forget that my legs attached me to that chair. My limitations have given me a new kind of freedom. It’s the freedom that only a great friendship can provide. It’s the freedom to be loved despite our differences. “It was good to go back to school and the project. Every day my teachers reminded me of how good God is and how He cares for us even though sometimes things happen to us. I am grateful for my friends and my family. 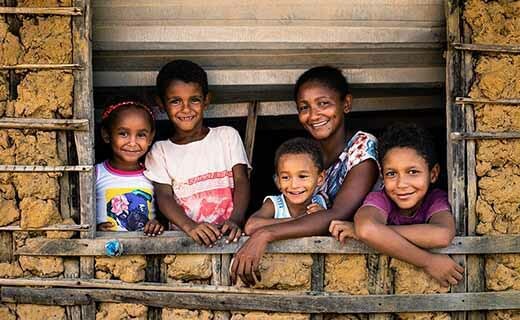 In our community I see many mothers who don’t take care of their children; some of these children spend days without bathing and receive no care. My mother and grandmother, however, have always been by my side. This was also a demonstration of God's love for me. 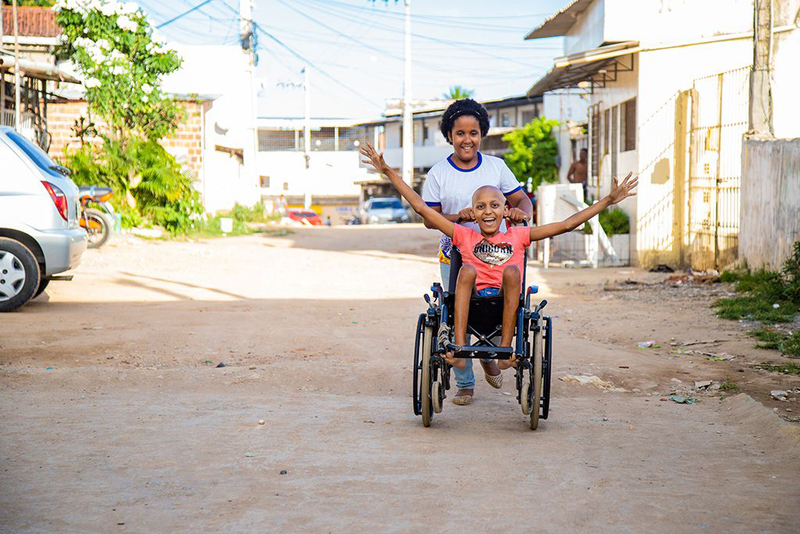 “I started doing physiotherapy, and the doctors said I could walk again. Gradually my life returned to what it was before. My hair grew again and filled my head with curls. Once again, I could venture out on the streets with Tainara and my younger brother, Kauan. My mother always worried about my health, but my brother used to help me down the stairs of our house and run away from home to play with the boys in the neighbourhood. The traffic light seemed green for my life. “But it didn’t last long. Soon it became yellow and red again. Earlier this year, doctors said I had new tumours in my lungs and my chest I didn’t understand why it was happening in my life. I didn’t want to lose my hair again, nor take the medications from the hospital. “Weeks later, I was once again lying in an operating room watching the ceiling lights while the doctors pierced my skin for anesthesia. When I woke up, there was a cut in the middle of my chest, but I was alive to smile at my mother one more time. In the weeks that followed, I started my chemotherapy sessions and lost my curls again. I'm still bald. “I cut the hair of all my dolls so they look like me, but playing alone isn’t cool. 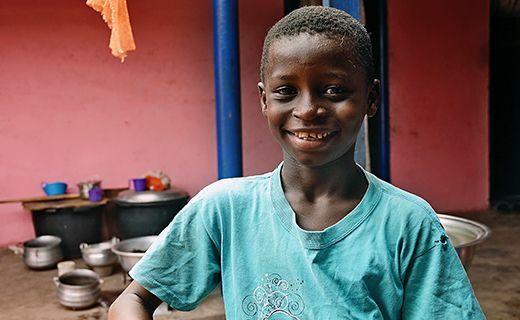 “As I’m still doing my treatment, at the moment I can't go to school or the project. When I’m not in the hospital, I spend my days at home. Our house is small, and there’s not much to do. I wait all day for my brother and Tainara to come back from school so they can take me to play in the street. My dream is to have a toy car that allows me to walk in the street and not need my friends to push me. For now, I imagine my chair is my car, and I even glued a car ignition on it. 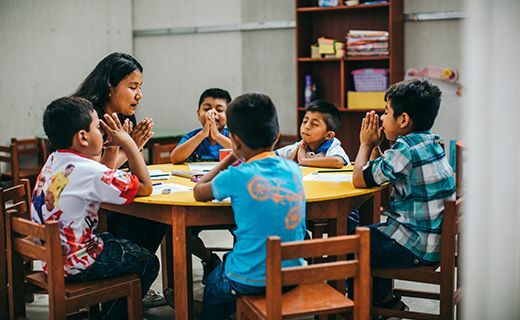 “On my loneliest days, it’s amazing to receive my teachers from the Compassion project. They’re constantly concerned about my health, and whenever possible they include me in the outings they plan with the other children. Last month we went to a water park, and I had a lot of fun with my friends. My mother doesn’t like to worry me, but I know the project also helps us with the medicines that the hospital doesn’t offer us, and when she has a hard time buying food for the week. I really don’t understand why God allowed me to get sick again. But I know He is good, and I believe that He will help me live a good life, regardless of how many decades I’m going to live. 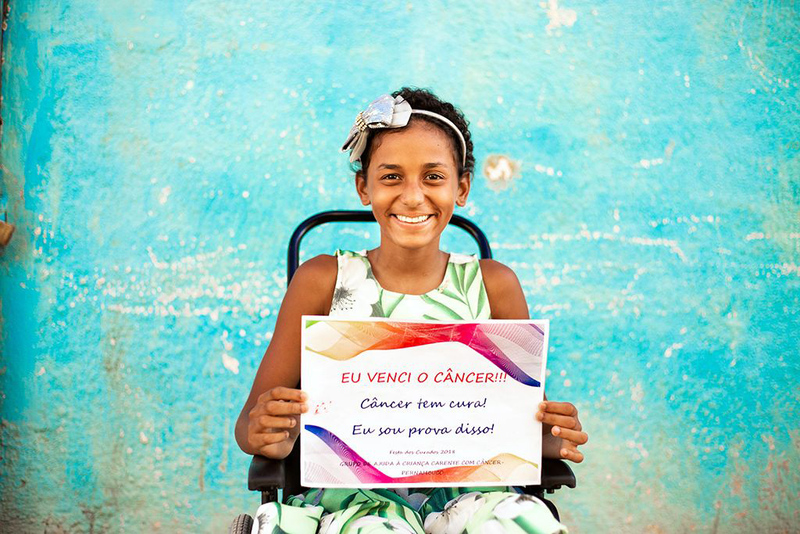 Update: Praise God, Kauany is cancer free! 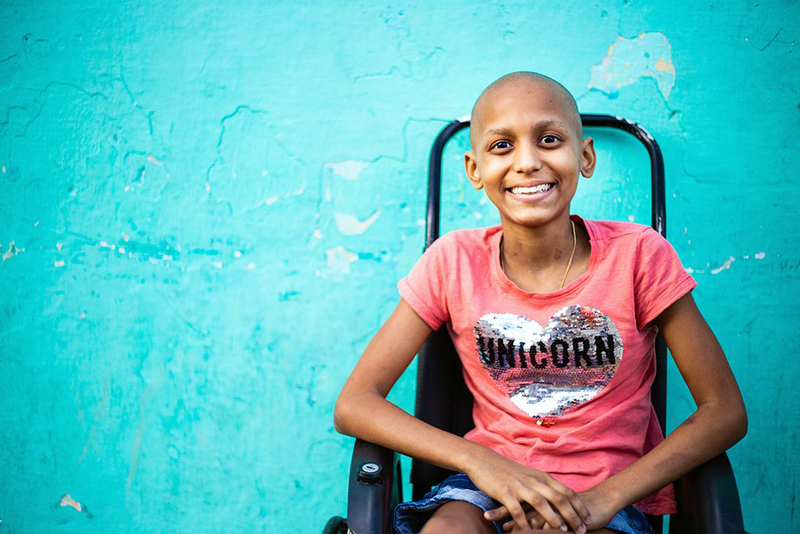 We're thrilled to share the news that Kauany is now in remission! Thank you for your faithful prayers for this courageous young girl. Kauany is so grateful that through the difficult times she has never felt alone. Praise God for Kauany's project workers who have supported her so faithfully. "When I heard that I was completely healed, I was trembling with joy. I cried, then laughed, then cried again. I'm very happy to know that it's all over" says Kauany. Heavenly father, we thank you for Kauany and the beautiful young girl you’ve created her to be. Thank you so much for answering prayers and restoring her to health. We pray for your protection for her health in the future. May Kauany thrive and pursue her dreams. Thank you for your church in Olinda, Brazil. For the men and women, you’ve placed around Kauany and her family to support and cheer them on. 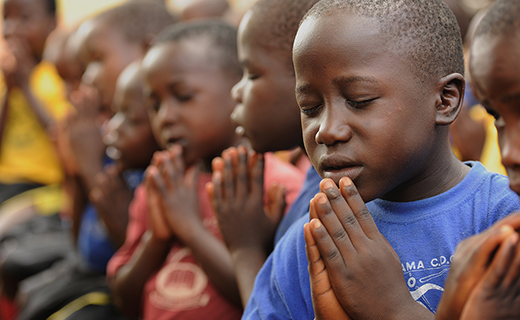 We pray for children all around the world who, like Kauany, are facing really tough situations. We ask that you draw near to them and bring your peace that transcends all understanding. We ask this all in Jesus name, Amen. What a lovely brave and cheery young girl. She is obviously loved by the Lord and all her family and friends. I pray she will be given strength and healing and a return of her hair, and that she and her family will feel the power of prayer that surrounds that home. So very moving, as well as being a testimony of how Compassion is helping. I shall certainly be joining the prayers for her healing, and strength and help for her dear family. 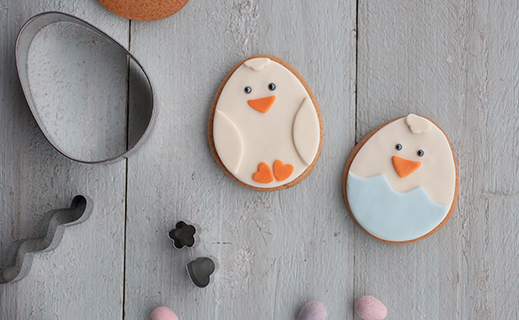 Have a go at this simple and seriously cute Easter biscuit recipe. 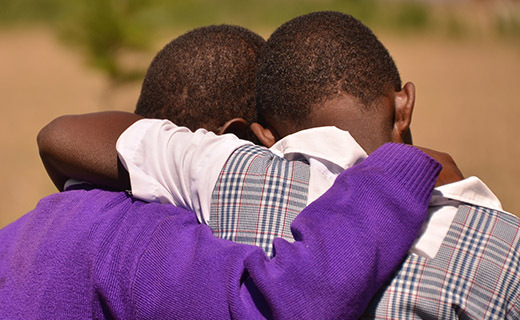 Please pray for all those who’ve lost loved ones and livelihoods in Cyclone Idai. 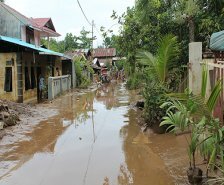 Please pray urgently for one child from our child sponsorship programme who is currently missing in Indonesia. 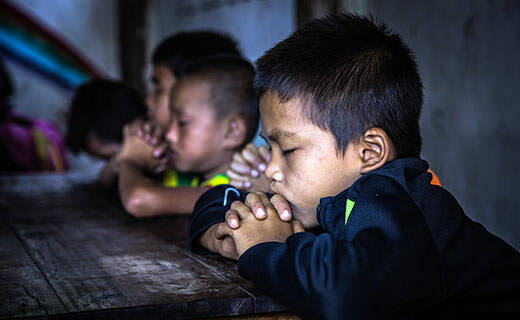 Our Compassion office in Peru has confirmed that 426 Compassion-supported children have been affected. 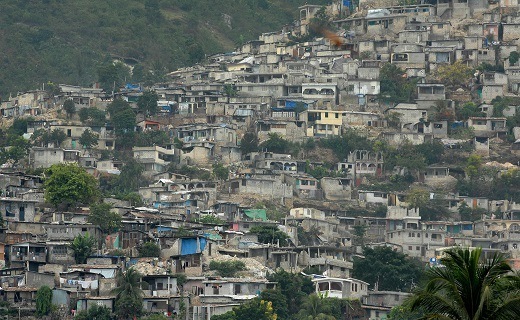 After a sustained period of unrest, praise God, tensions have reduced in Haiti. On World Day of Social Justice, let’s be bold as we share a prayer for injustice around the world. Take a moment to pray for three countries impacted by recent elections. Lift up the upcoming elections in Thailand and the Philippines. 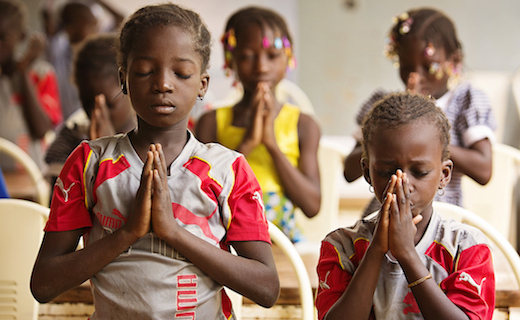 Pray for the thousands of initiatives and projects working in culturally sensitive ways to protect girls and their families. 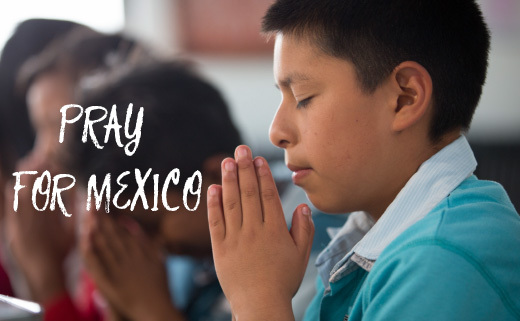 Join us in praying for all those suffering loss or injury in the aftermath of the Mexico pipeline explosion.